Because of the popularity of LCHF diets in Scandinavia Norway is experiencing a severe shortage of butter. There isn’t enough to prepare all the traditional Christmas food. Danish breakfast TV has now started a large rescue operation. They’re sending at least 1000 packets of butter to neighboring Norway. The LCHF revolution has so far only spread from Sweden to Norway and Finland. Danes still fear natural saturated fat, for no good reason. But that’s ok. It means more delicious butter for the rest of us. I don't think we ever have to worry about a butter shortage here in the US. The majority of people are still afraid of sat fat and, even though butter isn't all sat fat--or even fat--they still go for all those stupid margarines that claim to be better for them. Sad, but good for those of us not afraid of sat fat. Plenty of butter for us! I hope I'm still around when the results of the "experiment" are in and Sweden and Norway's rates of obesity decline and Denmark's rates of obesity continue to climb. It's a shame that the Rueters writer still finds it necessary to call LCHF a "fad". There's probably a donught sitting next to him on the desk! Butter is an important staple, so I always buy butter when I find it on sale, Kerrygold is my favorite, and keep extra in the freezer wrapped in foil. Butter makes almost everything taste better. Bacon is also an important staple to keep on hand. I used to keep flour and sugar on hand! Still need staples, but fat is the biggie now. This Danish TV show is definitely mocking the Norwegians. 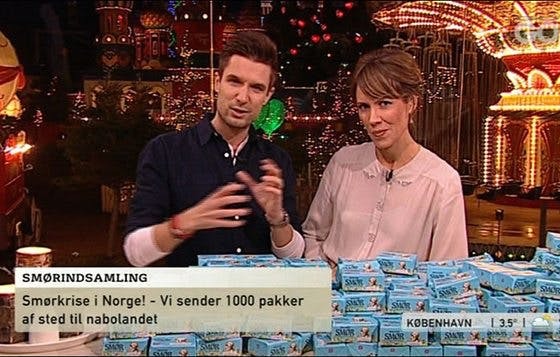 At one point it seems the presenter says "we must send butter to Norway, they are losing weight so fast! They are getting dangerously thin" or something like that -and then they laugh and laugh at the "ludicrous" idea that eating butter could help you lose weight. Apparently we have so much butter here in Indiana they can sculpture a life size cow out of it for the state fair every year! Yum! Patti: Same here in Ohio!